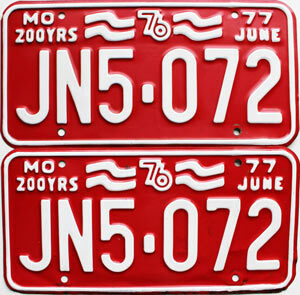 A 1977 Missouri Bicentennial license plates pair # JN5-072, one in slightly better condition than the other as pictured. In 1977, Missouri issued two license plates (a pair) and these may be a good candidate to run on a 1977 vehicle under the "Year of Manufacture" or YOM rules. Confirmation this license plate number is available to register with the Missouri DMV should be made prior to your purchase if this is your intent.